Did You Know That Phi Beta Sigma Has Very Deep Ties To The Justice or Else: 20th Anniversary Million Man March? Did you that the brothers of Phi Beta Sigma have a deep connection with today’s Justices or Else: 20th Anniversary Million Man March? In 1995, Phi Beta Sigma Fraternity, Inc.’s international corporate offices opened their doors and served as the official headquarters for the inaugural Million Man March. 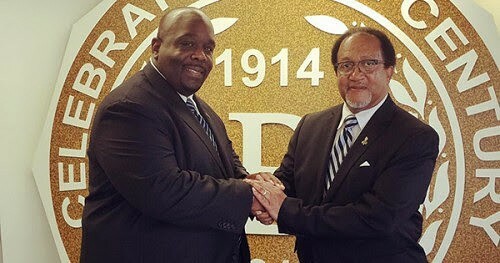 This year in honor of the 20th Anniversary of Million Man March Phi Beta Sigma Fraternity, Inc.’s International President, Jonathan A. Mason, Sr. opened up office space in his fraternity’s headquarters again to the march to Dr. Benjamin F. Chavis to serve as the National Mobilization Headquarters for the 20th Anniversary Million Man March. “We are once again proud to announce our commitment to the Million Man March. Twenty years ago, Phi Beta Sigma Fraternity, Inc. stepped forward and offered our headquarters as the staging location for the historic march,” said Jonathan A. Mason, Sr.“ Today, we celebrate the march’s milestones and reinforce our ‘I Am My Brother’s Keeper’ initiative, as we wholeheartedly support the Million Man March 20 years later,” Mason stated. “20 years ago Phi Beta Sigma Fraternity, Inc. made the historic decision to provide its headquarters building on Kennedy Street NW in Washington, DC as the national office of the Million Man March. Share this history and information with your network.